The home is a sacred place, because it is where you and your family live, and where memories are made. We all want what’s best for our family, and this includes safety. Fires are a devastating event that we all want to avoid, and one way to do this is to install a Class-A Fire Resistant to your roof. Could a fire happen to me? “During the five-year period of 2006-2010, U.S. fire departments responded to an estimated average of 371,700 home structure fires per year. These fires caused an annual average of 2,590 civilian deaths, 12,910 civilian fire injuries, and $7.2 billion in direct property damage. Home fires accounted for three-quarters (73%) of all reported structure fires, 92% of civilian structure fire deaths, 86% of the civilian structure fire injuries, and two-thirds (68%) of direct structure fire property loss. Homes include one- and two-family homes, manufactured homes, and apartments or other multi-family housing, regardless of ownership. In general, any fire in or on a structure is considered a structure fire, even if the damage was to contents only”. (NFPA Home Fires 2012). Yes, fires can happen to any of us. One of the best ways to slow the progress of fire’s or to even stop a fire from spreading to your house, is to have a Class-A fire resistant roof. What is a Class-A Fire Resistant? The American Society for the Testing and Materials (ASTM) and the National Fire Protection Association (NFPA) are two nationally recognized organizations, which have developed flammability tests, setting standards of flammability. On a scale of 0 – 200 (least to most), only those materials with a flame spread of under 25 qualify as a “Class A” Fire Resistants. In simplified terms, a class A fire resistant is a way to slow and stop the spread of fires. Class A fire resistant’s make your home safer, as more time allows you and your family to get out of harm’s way. Can provide a fairly high degree of fire protection to the roof deck. Does not slip from position. Does not pose a flying-brand hazard. How does the ASTM test for fire resistance? “These test methods measure the surface spread of flame and the ability of the roof covering material or system to resist fire penetration from the exterior to the underside of a roof deck under the conditions of exposure. Is Slate a class A – Fire Resistant? 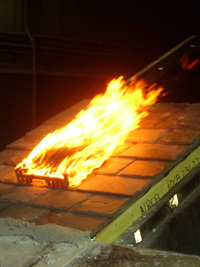 The testing was inspired by a change in the International Building Code (IBC), the 2009 edition of which recognizes slate roof assemblies as having a Class A fire resistance only when installed over a noncombustible roof deck. Previous editions of the IBC designated slate roof coverings as having a Class A rating when installed over combustible and noncombustible roof decks. 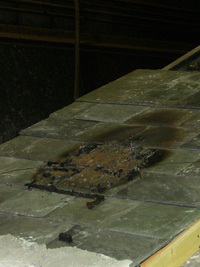 The test assembly consisted of nominal 1/4-inch thick, North American slate shingles laid with a 3-inch headlap over No. 30 felt underlayment on a 1/2-inch plywood roof deck. The tested assembly achieved a Class A rating. Most home fires spread across a neighborhood, by way of the roof. This has resulted in any competent city and housing development, to require a flame resistant roof. A Natural Slate Roof, gives you as a homeowner a peace of mind. With a slate roof that will last 100 years, you also gain the assurance of having a class-A fire resistant roof, which slows the progression of fire and allows you to get to safety, and in many cases stops the spread of the fire to your house. Most Home-Insurance companies take into account the fire resistance of your roof. Having a Class-A fire resistant roof allows you as a homeowner to save hundreds of dollars, making the roof that much more appealing. As a home-owner, you have a responsibility to yourself and your family, to choose a roof that can stop fire in its tracks. For this purpose, make sure to use Georgetown Slate.